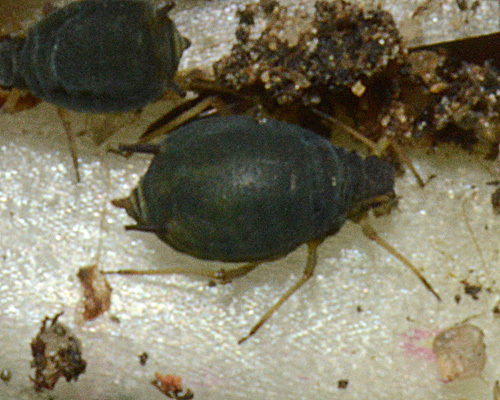 Adult apterae (see first picture below) of Aphis lambersi are blackish-green, dark mottled green, or (less commonly) purplish brown. 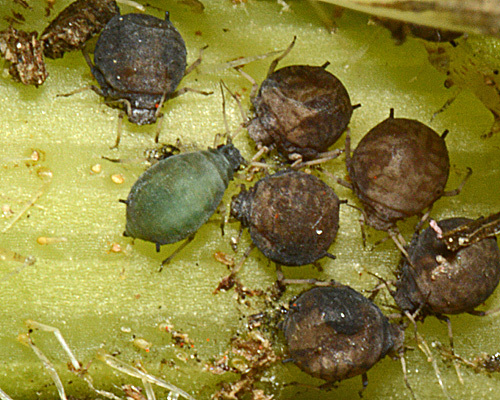 Aphis lambersi resembles (but is not especially closely related to) other dark green species such as Aphis plantaginis and Aphis violae. The dorsal abdominal sclerotic pattern consists of a dark band across tergites 7-8, small postsiphuncular sclerites and dark intersegmental sclerites. The siphunculi are dark and relatively short being 1.06 - 1.75 times the length of the cauda. The body length of the Aphis lambersi aptera is 1.3 - 2.2 mm. Alatae (see second picture below) are shining blackish green and have additional marginal sclerites, larger postsiphuncular sclerites and rudimentary bars on tergites 1-2. Marginal tubercles on the aptera are prominent and mostly subconical in shape (see micrograph below). Leg hairs are short, mostly much shorter than the least width of the tibiae. The males are apterous and the ovipara has slightly thickened hind tibiae. 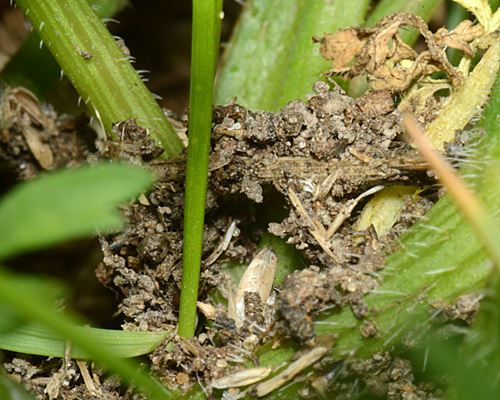 Wild carrot root aphids live on the root collar or in basal leaf sheaths of wild carrot (Daucus carota) tented over with soil particles and plant debris by ants (see second picture above). 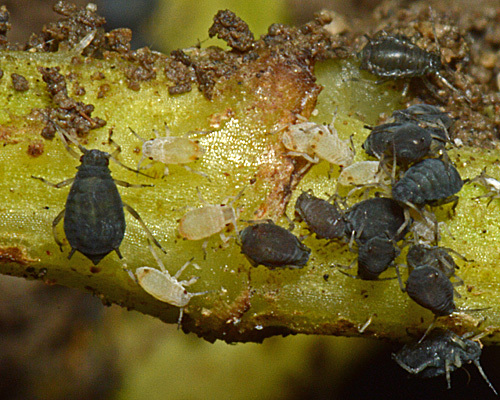 Aphis lambersi is widespread and fairly common in southern England, and throughout Europe. We have found Aphis lambersi at several sites in southern England including Rye Harbour in East Sussex, Seasalter in Kent and near Clifton in Bedfordshire. 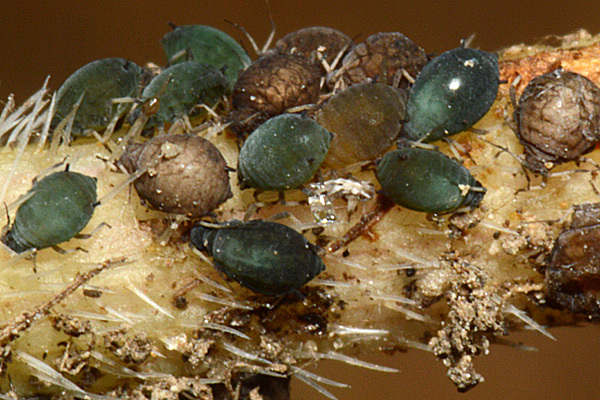 Aphis lambersi has a number of colour forms ranging from blackish green through dark mottled green to purplish brown. Some of these colour forms are shown in the picture below. We have repeatedly found Aphis lambersi in mixed species colonies with a Dysaphis species, either Dysaphis crataegi or Dysaphis apiifoilia. 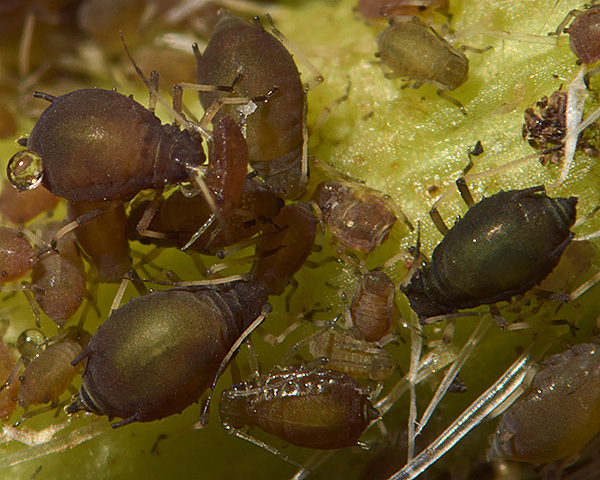 The picture below shows some dark green Aphis lambersi with some very pale Dysaphis, the latter with reddish-orange patches around their siphunculi. 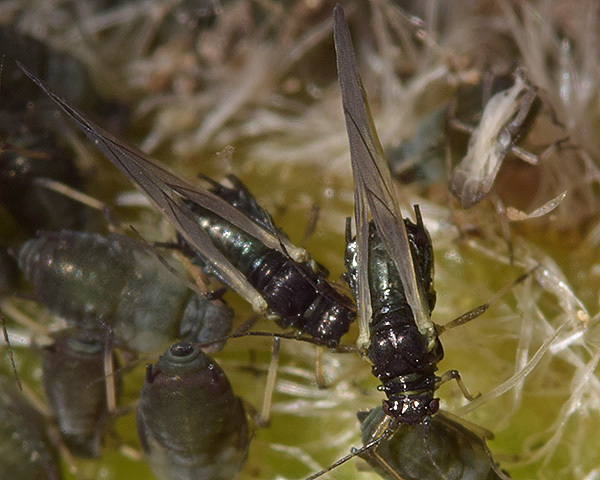 In East Sussex we found the species heavily parasitized by a braconid parasitoid (see pictures below). Starý et al. 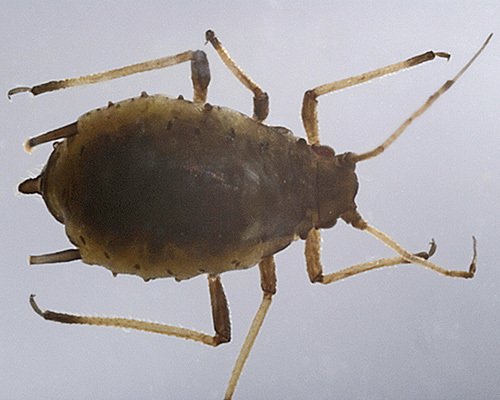 (2014) have recorded Lysiphlebus fabarum as a parasite of this species of aphid. Blackman & Eastop list 22 species of aphid as feeding on wild carrot (Daucus carota) worldwide, and provide formal identification keys. Of those aphid species, Baker (2015) lists 16 as occurring in Britain: Aphis craccivora, Aphis fabae, Aphis gossypii, Aphis lambersi, Aphis spiraecola, Aulacorthum solani, Cavariella aegopodii, Cavariella pastinacae, Dysaphis apiifolia, Dysaphis crataegi, Hyadaphis passerinii, Myzus ascalonicus, Myzus ornatus, Myzus persicae, Pemphigus phenax, Rhopalosiphoninus latysiphon and Semiaphis dauci. We especially thank Alan Outen (Bedfordshire Invertebrate Group) and Rye Harbour Nature Reserve for much kind assistance in obtaining the images above.